This mod is obsolete, and hence abandoned. I'm a huge fan of RenPy's autosave and rollback features. Some game designers 'hide' these features as a design decision, but they are often still lurking/available under the hood. Such is the case with Dating My Daughter, so I took the time to 're-add' these to the interface for 0.10. Note: I use a windows environment, but this should work in other OS environments that allow you to play DMD in them. Non-windows users: let me know if this is not the case. This is a simple and very straightforward mod, that 'restores' autosave and quicksave, and also 'restores' rollback options. The date and time for saves will now be displayed above each save/load slot thumbnail when using this mod (this is a RenPy feature that was also hidden, and thanks to a suggestion made by 3xpurt, one which I was able to re-add easily enough). Note that 'quicksave' is really just another page to save games on, but an extra save page is always useful. I say 'restore' because that functionality is already active in the DMD/RenPy game framework, but the appropriate buttons were excluded from DMD so that you couldn't access these features. This mod allows you to access those features. I have packaged the DMD_10_Autosave.7z in such a way that you can simply drag the game folder contained within this .zip into the extracted DMD 0.10 folder. It should automatically place the new art assets and two modified files in the proper folders. You'll get a couple of messages asking if you want to replace folders and files. You won't actually be replacing any folders, just adding content to them, but two files are being replaced with modified ones. It does replace two files (/game/gui/config_ground.jpg and /game/screens.rpy, so you may want to back those two files up first. If the screens.rpy file has already been modified (by another mod), you may want to compare the files for changes. This is not a commonly modified file, so this should work fine in combination with other DMD mods. I am looking for feedback. Let me know if you have any issues using this mod. , or your RenPy extractor of choice, following the instructions in the linked thread. Choose option 4 if you are using the unren.bat tool. In the game folder, make a backup copy of screens.rpy, and in the game/gui folder, also make a backup copy of config_ground.jpg, in case you want to uninstall this later or something. These are the only two game files that get changed. Drag the game folder contained in the attached DMD_10_Autosave.7z file (file at bottom of this post) into your root Dating My Daughter 0.10 folder. This should automatically place the relevant files in their corresponding folders. # How often do we autosave. (Number of interactions, sort of.). # Should rollback_side be enabled? If you've enabled rollback on the left or right side of the screen (or both! ), you can simply click on the left and/or right edge of the screen to roll the dialogue back to the previous entries. NOTE, however, that you cannot roll back any farther than the last 'choice' you made, even if there is only one choice available. I've tested this with Ikaruga's DMD 0.10 Mod (and indeed posted a version of this there), with no issues. This should work with any DMD mod that doesn't already modify the Config and Load/Save interfaces (specifically the screens.rpy file), with no issues. Note to other modders. Feel free to include this in your own mod as you see fit. It's a really simple/small mod, so I'm not too concerned about getting credit for it, just be polite and don't claim credit for something you didn't do yourself. And (disclaimer) I simply modified a couple of the DMD art assets to re-add the features, although I did create 3 new buttons, so credit for the art design still goes to MrDots, not me. The 'single up/down arrows' on the load and save pages will advance/back up the pages by 5, with the double arrows advancing them by 20. Or you can just use the scroll bar. BTW, I moved the 'edit father and daughter's name' feature from the Portrait to the Friend/Love points icon immediately below. Click on the Green Circle/Red Heart to edit their names. Hovering over these icons will also give you a tooltip message letting you know about this. Version 6: (7/21/17) Updated to show the new variables and save descriptions which were added by DMD 0.11. New load/save navigation interface including a scrollbar. Version 3: (6/20/17) Show the date/time saved above save/load slots, Added readme and screenshot to 7Zip file for reference. Version 2: (6/18/17) Used a new, more descriptive filename for 7Zip package, created this thread. Version 1: (6/17/17) Initial release, shared in another thread. Edit 08/18/17: Attachment for V12 file added. Edit 09/22/17: Tested V12 with DMD .13, working for me, awaiting feedback. Nice job. Another thing that annoys me about DMD, is the time-stamp on the saves is missing, so I have to guess which one I last used. No idea why someone would hide that. I'm guessing that's something that I could address at a future date, but I'd have to do some research first (to see where the time stamp call is usually found). I had to compare the DMD screens.rpy vs the default screens.rpy to figure out how to restore the rollback feature, and the auto/quick save pages, so I'll make an effort to look into the timestamp implementation at some point. Take this screens.rpy for a test drive please (in .7z file attached below) please, and let me know if it works for you. This shows a timestamp for the load/save slots, and apparently is retroactive (the old saves are showing up with save times in my game). I may be able to add more info to the save time/use a different date and time format, but for now let's see if it works. Edit: The date format and placement in the file below is probably the one I'll be going with. The file below seems to work fine, and I am looking for feedback, so feel free to try it out and let me know how it goes. Edit: replaced the .7z file containing the modified screens.rpy with a new version. Reformatted/recolored the text for the timestamp, and scooted it above the thumbnail so you may read it more easily. Also added screenshot immediately above this paragraph. Attached .7z file has been replaced with new version. Will add to OP once I get some feedback/make sure it's working properly. Feedback welcome! So, I haven't had/no one has mentioned having any issues with the updated screens.rpy, so I updated the OP with a new version of the .7zip mod file. The updated .7z file in the OP contains the new screens.rpy (which will show save/load timestamps), a ReadMe with information and instructions (the same instructions that are in the OP), and a screenshot (the updated screenshot that is now in the OP) for reference purposes. , replacing the screens.rpy that is located in the DMD root/game folder. The screens.rpy file is the only game file that has been changed since the original version of this mod. Sorry OhWee, I haven't even had time to test it, buy I'm sure someone would have said something by now regardless. My life lately has been wake>work>home>eat>sleep>repeat. Hey, no worries at all! Let me know if it works OK when you get the chance. I haven't had any issues, so I'm not that worried, but feedback is always a good thing! And thanks for the suggestion! It was a pleasure to (re)add Timestamps to the saves. MrDots significantly modified how save slots are displayed/formatted, so there was a bit of trial and error to get the relevant code to work properly. I'm sure that it was an artistic decision on his part as to why he didn't retain the display of the save date/time info. What does the renpy rollback feature do? It allows you to 'back up' through the dialogue entries, which can be handy if you missed something. It's limited in that you can't 'back up' past your last choice (even if their was only one choice available), but if you are rapidly clicking through dialogue, and feel like you missed something, this can help. As far as if you've missed something once you hit a decision gate/choice options, well that's where the last autosave or two can come in handy. If you missed the conversation before the choice option, simply load the autosave and then advance more slowly through the dialogue options so that you can read them more thoroughly, and if needed, rollback from the autosave point to the previous choice/decision gate. For those of us that have played this game a few times, if you ever need to fall back on an old save, flying through the dialogue with rapid clicks is sometimes the order of the day, as you have already read through a lot of the stuff before. 1) you can already "roll back" through dialogue, even choicxes, with the default game. I do it with the roller/middle mouse button on my mouse. 2) "rapid clicks through dialogue", you know holding the "control" key skips the dialogue you've already seen? 3) Missing a choice..You can literally "save" on a choice screen with a right-mouse click. Again, nice to see modders go to work, but unless I am missing something it would probably take more time to install this (even if its a simple copy/paste) and use it than just use the base game features? Or am I missing something that's obvious to everyone but me? I'm all for using mods that help fix clunky interfaces, etc. Exactly. This thread is useless and should be removed. This is very good to know, IF you have a middle mouse button/scroll wheel which set up for page up/page down. My mouse has two additional features instead, which are currently set up for 'back' and 'universal scroll'. RenPy doesn't understand universal scroll, although most other applications do. If your mouse doesn't do 'page up/page down' (no scroll wheel, for example), clicking on the left or right side of the screen can be a nice fallback, and doesn't break immersion as much to boot (i.e. having to use your hand/eyes to locate the page up/down keys if you don't use those keys often). Also (just double checked) the keyboard I have for tablet mode on my 2 in 1 doesn't even show page-up and page-down when I first pull it up. 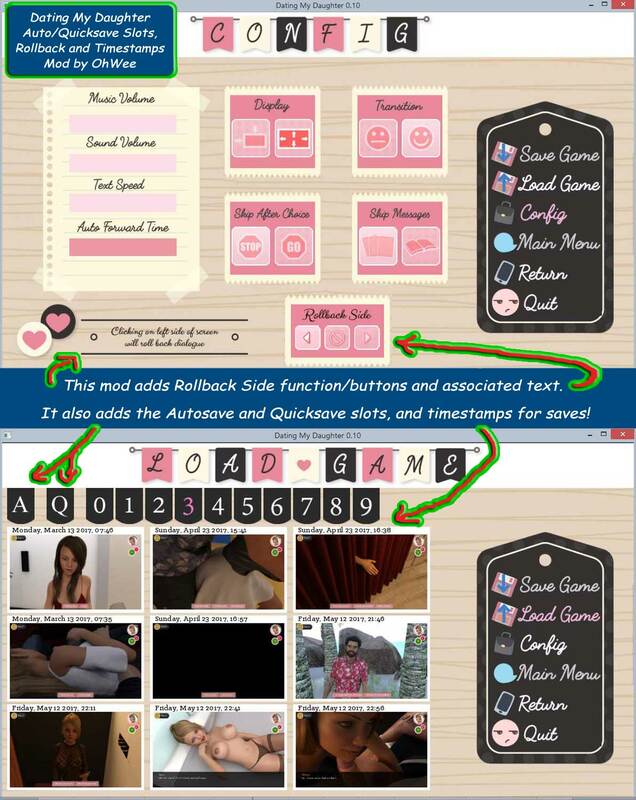 If you are in tablet mode, being able to assign rollback to the left (or right) side of the screen is very handy. Fortunately, you can click the menu icon in the upper left corner to access the save/load/config/etc. screens. Back to regular keyboarding: Page Up (just looked it up) will also give you rollback, AND will rollback through dialogue choices, with Page Down rolling forward. Thanks for this tip! Not everyone that will download D.M.D. knows what RenPy even is, and may not realize that they may want to take the time to look up/google for the keyboard shortcuts for RenPy. They just want to play the game. And some designers may choose to completely disable this additional functionality in any case (thankfully, Mr Dots hasn't, YET). That being said, using the ctrl key to rapidfire advance is can be very useful when replaying the game, and you are correct to bring up it's usefulness in this regard. This mod (most importantly) also makes your autosaves available to you (something that was removed from the interface, as well as the additional 'quicksave' slot), AND shows timestamps on the saves (something that was also removed). If neither of these are useful to you, then you don't need my mod. If you forget to right click to save at some critical point in the story, and don't realize it until after the fact, being able to load an autosave can be a lifesaver. Right clicking (to save, etc.) breaks the immersion of the story as well. The autosaves are '9 deep', so you usually have a few autosave options if page-up doesn't get you back far enough. I have tried your mod but it doesn't work. Normally I can save a game with using the right mouse button, it will not work, no chance to save. I always get an error screen. I have used a game version, which I succesfully have modified with Ikaruga's DMD 0.10 Mod, maybe i should first apply your mod. and b.t.w your mod (7z file) doesnt extract its content not in the right place in game. I had to copy them manually in the right subdirecteries. o.K., with a new DL of DMD 0.10 I have tried it again. Yes, the mod works without the mod from ikagura. Then I have added the mod from Ikagura, and with the first start I've got an error message (scripting), but klicking it away, with the next start everything is working well. Hmmm, not sure how I've managed to miss your guy's posts. I visit this forum regularly. I'll look into your errors. My version of the Ikarugamod is a bit older maybe, I didn't have any issues with it, but I'll check the updated version if there is one. Anyways, apologies for missing your posts lazyharry. Looking into it now. 1) Drag the Dating_My_Daughter-0.10-win folder from inside the downloaded DMD .10 zip to where I put my games (in this case c:/games). which is inside my my dmd_10_screens_autosaves_timestamp_mod_v3.7z folder into the Dating_My_Daughter-0.10-win folder. This brings up the message about modifying the game folder and the gui folder, and also the replacing of two files. 5) I then dragged the modified files from the ikarugamod into the Dating_My_Daughter-0.10-win/game folder, which replaces a few files. 6) I then dragged in the 0.10 extras files into the Dating_My_Daughter-0.10-win/game folder, which doesn't replace anything. Then tested, still no errors for me. Note that I've also checked my mod by dragging my files into the DMD folder AFTER the ikarugamod was added, and also after the extras were applied, and didn't have an issue. I've also tested my mod with DMD 0.09, again no issues for me. I probably should 'un-nest' the folder in the .7z that has the same name as the .7z file, as it's redundant. I'm considering adding a quicksave button option at the moment; I just figured out how to do that in another mod, but as long as you drag the game folder (enclosed inside the dmd_10_screens_autosaves_timestamp_mod_v3 (sub)folder) into the DMD root folder (so that you have two game folders in the same location, forcing the merging of the two folders), all should be good as far as placing files. There's also an issue with the readme (I have the wrong forum thread link listed for this thread), but that's not a major issue. I can see how dragging the redundant folder into the DMD root folder could cause issues (because it'll put the game folder into a different folder that the game doesn't use). Is that what happened in your case lazyharry? Shwet, lazyharry, walk me through your install and extraction processes. Let's see if we can figure out what's up... Also, what OS are you using? OK, so I've added an ingame quicksave button now, which will save to at least 8 of the 9 visible quicksave slots, rolling the other quicksaves down the line. See upper left corner in the image below. Simply click the Blue Quicksave button ingame to save to the Quicksave slots. Attached is a new .7z file, which contains an updated version of this mod. It changes the intro.rpy file, so you'll probably want to back that one up. This will allow you to stay 'in game' while doing a quick save, as opposed to going to the save screen menu page. Note that the ikarumod has the intro.rpy in his mod pack, but according to WinMerge, his file is identical to the .10 base file, so apparently nothing was changed. Nonetheless, if you install his mod after mine, you'll want to swap out the intro.rpy file for the one in my mod folder. New version attached below. Adds new intro.rpy file and two new art icons, and I edited the readme appropriately. Assuming no showstoppers, I'll update the OP with the new version after the next couple of days.